Oh fiddlesticks! You've gotten yourself in quite a bind. You promised your best friend you'd cater her elite Halloween costume party (you are a celebrated chef, after all). But you hadn't thought about the whole costume part. You thought maybe you'd be behind the scenes, but she wants you doing cooking demos and requests open food stations throughout the event. This may be out of your wheelhouse, but relax, you don't need to go see the Wizard; we've got you covered (as always!). This Wizard of Oz Dorothy Apron is half apron, half costume, and 100% functional! It'll be a nice nod to the night's costume theme, without undermining your professional appearance. Pretty perfect, huh? 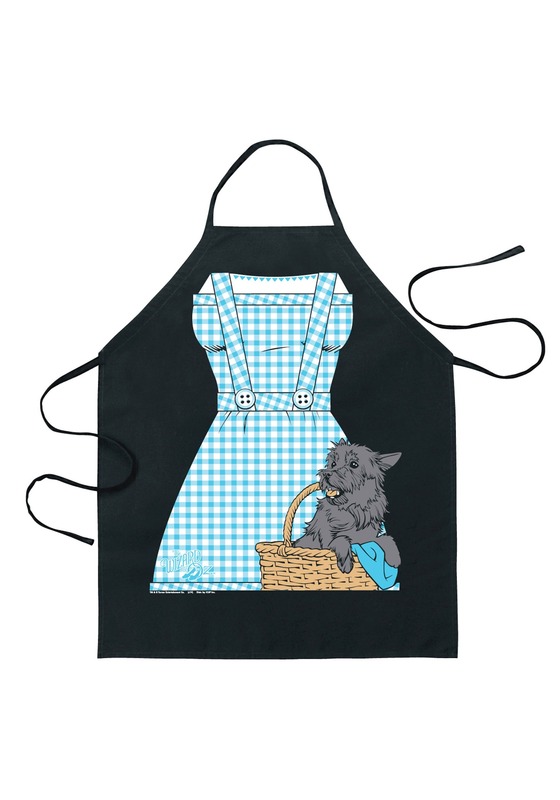 This amazing little apron is officially licensed, and crafted from 100% cotton. Not only that, but the black hue will help hide stains and kitchen mishaps, keeping you looking clean on the scene. It's printed with Dorothy's signature blue-and-white gingham dress and apron, as well as Toto in his little basket. Plait your hair into braids and wear this to add costumed flair and festivity to the event! This apron may inspire new creativity in the kitchen—like poppy seed ice cream or lollipop-glazed salmon—or even a whole new company for you: Yellow Brick Road Catering! Have fun, be bold, and enjoy your Halloween gig!